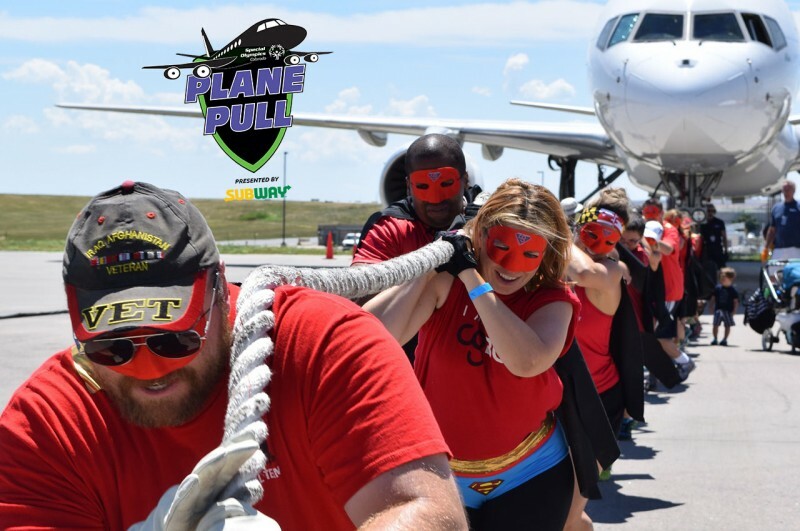 On Saturday, August 4th, join Special Olympics Colorado and our Law Enforcement Torch Run partners for the 7th Annual Plane Pull presented by SUBWAY Restaurants at Denver International Airport. If you’ve never participated in the Plane Pull before, this is your chance! This giant tug-of-war between your team and a 164,000 lb airplane is a unique, team-building event that brings Colorado communities together for a friendly competition. A big thank you to our friends and sponsor, Fed Ex, for donating the freight plane for our event which is exclusive to Special Olympics in Colorado. HOW IT WORKS: Teams of no more than 25 challenge each other to pull a jumbo jet 12 feet across the tarmac in the least amount of time! Teams must raise a minimum of $1,250 to participate ($50 each on a 25 person team). All funds raised help Special Olympics Colorado provide year-round training and athletic competition to 24,000+ athletes with intellectual disabilities statewide. *The event ends when the last team pulls, approximately 2 p.m. Please be registered or checked-in by 11 a.m. to participate. Plane Pull is family friendly! Kids love pulling for a purpose and being part of a team with superhero strength. We’ll have vendors, sweet and savory bites, beverages and entertainment for all! Prizes will be awarded to the fastest team, slowest team, best dressed team (Team costumes are a big plus! ), top team & individuals fundraisers, and fastest LETR team. Participants can also opt in to receiving fundraising incentives during the registration process too. Top fundraisers will be determined based on totals as of Friday, August 3, at 3:00 p.m.
Register online today. Day of registrations will be accepted.